« Saratoga Yearling Sales 2018…One Night, Two or Three…Reserve Now, Race Fans. The Brunswick at Saratoga Bed & Breakfast Presents: Christmas in July. And August. No, no, you didn’t do a Rip Van Winkle, and fall asleep–only to awaken eight months later. Relax: it’s still April in upstate New York. Well, and everywhere else on Earth. Your last name may not be Vanderbilt. So you may not have six weeks to spend in Saratoga during our world-renowned horse racing season. Heck, you may not have three consecutive days to cut out of work and enjoy the ponies. Any ponies: Thoroughbred, Standardbred, polo. Sigh: if you can find accommodations for just one night, maybe squeezing out two–it’ll probably be at someplace 35 miles away, on Central Avenue in Albany. Adding more than an hour, round-trip, to Saratoga and the race tracks/polo grounds/ ballet / hiking/ biking/ shopping/ dining. The whole reason to come to Saratoga in July and August is to be in Saratoga, right? So our December Holiday 2018 gift to you is: you can be right in the midst of all the Saratoga action–all the horse-sports madness and glory–right here on our magnificent boulevard, Union Avenue. 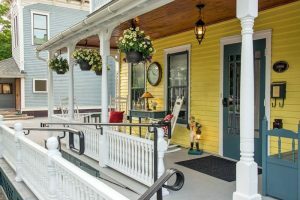 You can wile away your evening if you choose on our homey porch, right across Union from North America’s oldest sporting venue of any kind–Saratoga Race Course. And you can do this, one night at a time. Because, unlike most places in our internationally-beloved tourist Mecca–and most places south and north of Saratoga Springs–here, we welcome you for your one, lovely, stolen-from-real-life getaway night. You may have only one night to come to Saratoga, all summer. Or you may have the ability to grab one night, every other week, during racing season. So your name’s not Vanderbilt. Neither is ours. We get it, that one night–mayyyyyyyyybe, two–is all the time you get this summer. We’re cool with that. Whether you stay with us for a month or one glorious Monday night–we’ll give you the most comfortable bed in all of Saratoga, and refresh you in the morning with a singularly-delicious, gourmet breakfast. We don’t see you as a number. To us–you’re just, folks who stay with us. One night at a time. For inquiries and to make reservations for your Saratoga Getaway, one night at a time, give us a call: (518) 584-6751.